October housing starts released Nov. 18th didn’t come in as expected. The annual rate for October is 1,060,000 new starts vs 1,191,000 in September and 1,079,000 in October last year. BUT look a little deeper than just one month. The last 4 months of starts have been pretty high, averaging 14% higher than the previous 4 months and 16% higher than the same 4 months last year. Take a look at this chart. Monthly starts periodically peak and dip erratically. Look at February 2015, the biggest dip in 5 years. But then notice it took less than 4 months for starts to come right back to the trend line and the trend remained intact. This is how the monthly housing starts data goes. So don’t get too alarmed over one month of data. Now if this downward trend were to continue for several months, go ahead get concerned, but that hasn’t been the pattern. The good news is 2016 construction spending will be up across the board, although growth will vary between the three major sectors, residential, nonresidential buildings and nonresidential infrastructure. This post is about how we will get there. 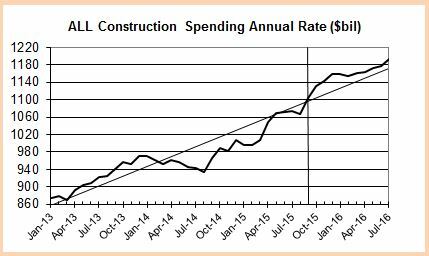 This plot shows a three year pattern of spending for nonresidential construction. The seasonally adjusted annual rate is plotted every month and the horizontal bars show the total average spending for each year. I often include a linear trend line in my plots because it’s good to be reminded of the long term direction and rate of growth rather than the monthly fluctuations. I’ve removed the trend lines from this plot to make a point. A fairly typical growth year shows spending finishing the year at a higher rate than when we started. The total spending for the year (shown by the horizontal bars) is the sum of the unadjusted monthly values, which is the same as the average of the monthly adjusted rates of spending. The plot above shows spending for buildings totals of $330 billion in 2014, $390 billion in 2015 and $430 billion in 2016. If spending always occurred evenly we would see a smooth constant slope plot line indicating the rate of growth, sometimes punctuated with minor monthly declines but over the long term up at a constant rate. The plot for buildings shows a pretty constant growth pattern from March 2014 to March 2016. We see a few slight monthly dips and a flat spot in mid-2015, but overall fairly constant growth. That will all change in 2016. The plot shows both buildings and infrastructure will experience multi-month declines in 2016. By midyear both will dip so low that the year over year comparison will drop to near zero percent. 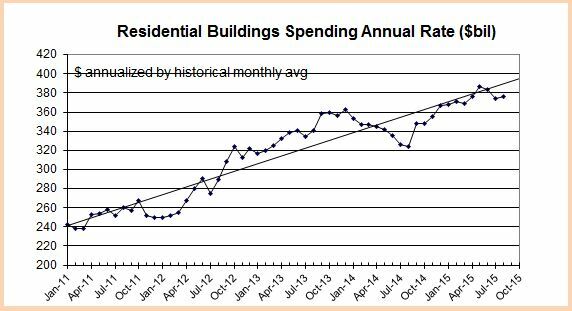 Spending on buildings will drop more than 10% from the 1st quarter 2016 high to the midyear low. (edit 11-16. Most recent analysis is showing the nonresidential buildings peak and drop is moved out about 4 to 6 months. The plot above does not reflect this most recent analysis.) Infrastructure will drop in a similar pattern but not as dramatically. Both will resume growth and finish the year at or near the yearly high. Together these major sectors make up 60% of total construction spending with residential being the other 40%. The magnitude of these declines will be large enough to drag total construction spending down for the period, but it too will resume growth and finish the year well above where it started. Spending in any given month is the sum total contributed by all the projects that started and are currently underway. That includes spending from projects that started recently with foundations just coming out of the ground and also projects that started 18 to 24 months ago that are near completion and near ready for occupancy. Spending is affected by the pattern of starts recorded over the previous 24 months. Only if that pattern is even in growth will spending be even in growth. Let’s make some assumptions for an example that should be easy to understand. All projects take 20 months to build. The construction budget gets spent at a constant rate of 5% per month. Every month includes some spending from all starts over the previous 20 months. New starts in any given month contribute only 1/20th or 5% to total spending that month. Predicted spending 3 months out includes only 15% from new starts, 4 months out 20%, etc. Nonresidential buildings spending in 2016 includes projects that started all the way back to mid 2014. 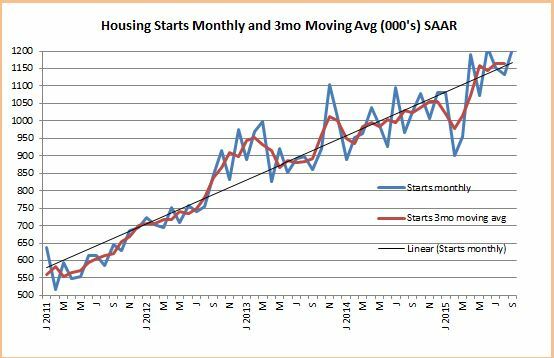 From April 2014 to April 2015, concentrated mostly in mid to late 2014, there were several instances where monthly starts exceeded the previous month by 50%-60%, then settled back. 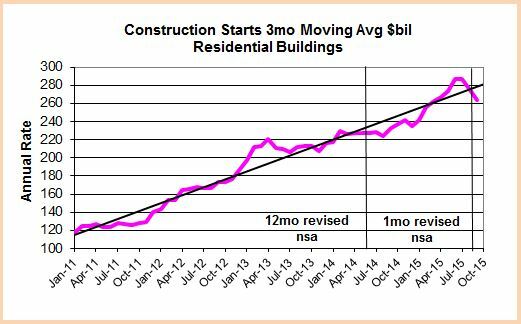 Those were great months and indicated a huge growth spurt in nonresidential building construction. We see that growth from early 2014 all the way up to a peak in early 2016. 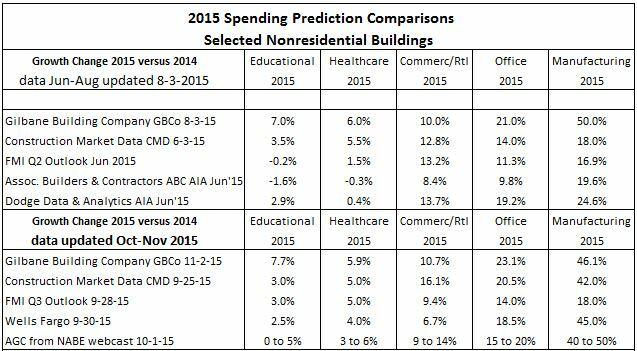 Nonresidential buildings spending experienced growth of 9% in 2014 and 19% in 2015, with 9% growth predicted for 2016. We don’t typically see a seesaw pattern in spending from the starts when all the projects are ongoing at the same time, we see flatter and steeper rates of spending growth. The six biggest months from that period averaged more than 30% higher than the current rate of new starts growth. So we’ve had a pause in the rate of increase for new starts. We see the big affect on the spending pattern when a very large volume of spending from starts 18 or 24 months ago reaches completion and drops out of the current month spending. That is what will happen in 2016. 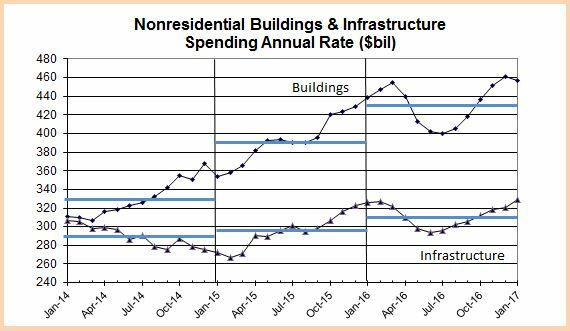 New 2016 nonresidential buildings starts is not the cause of a 10% dip in spending in 2016. It is the completion of a very large volume of starts from 2014 that will no longer be contributing a large share to monthly spending. That will work itself out by year end. But for those who do not look at the patterns that contribute to current spending it will create quite a stir. 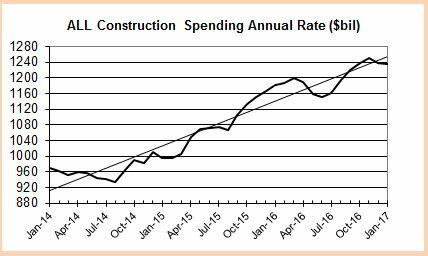 Three to five months of consistent declines in spending will look like the end of recovery in nonresidential construction. It is not the end. 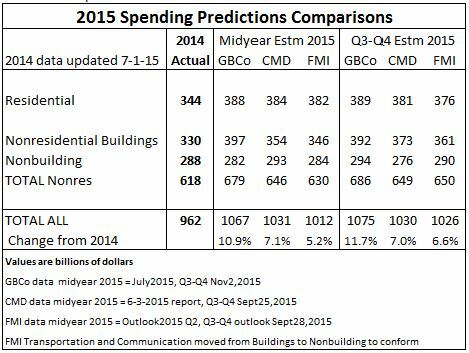 Here’s a peak at expected annual Construction Spending for 2015 and 2016. 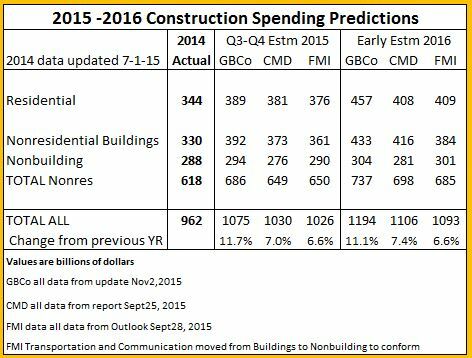 My predictions (GBCo) include the latest actual construction spending data released Nov. 2nd for September spending. This updated projection also includes revised future spending based on Dodge Data & Analytics construction starts released at the DDA Outlook 2016 conference Oct. 30th. My prediction for total spending in 2015, now at $1.075 trillion, hasn’t changed much (up 0.7%) since August. However, for next year my projection has increased from $1.150 to now expecting total spending of $1.190 trillion in 2016. Both projections will be further refined in my winter economic report. Why are my predicted values so much higher than other estimates? I put emphasis on using the cash flows from all previously recorded construction starts to predict future construction spending. I’ve talked about and documented in past reports the correlation between these two data sets. For 2015, with only three months left to go, 80% to 90% of all starts that will generate spending in the final three months are already in place. Very little affect on total 2015 spending will be brought about by new construction starts in the 4th quarter. New starts could crash to a level less than one half of current trends and that would still not affect total spending enough to get below $1.050 trillion for the year. In order to have the final total spending come in less than $1.040 trillion, the rate of spending for each of the next three months would need to drop off to the level of a year ago. That is not what the cash flows are indicating. In fact, cash flows are indicating spending will increase in the final three months of 2015. The cash flow plot provides us with the direction and the rate of change, but not the actual value of spending. With the September actual spending values included in the data, the statistical average of predicted spending for 2015 is $1.073 trillion. My cash flow analysis by sector predicts 2015 will finish at $1.075 trillion. In 11 out of 14 years, the actual final value has been within 0.5% of the predicted. The statistical analysis gives a predicted range for total 2015 annual spending between $1.066 trillion and $1.086 trillion. The actual spending total has not fallen outside the statistical range since 2001, as far back as I’ve been tracking the data. I’m confident that total spending for the year will fall within this predicted range.